Thank you for making this a memorable year. Visitors from 162 countries. Most came from The United States. Germany & The United Kingdom were not far behind. Not sure what makes a particular post popular. Heck, it could be the weather. But if there’s anything you want me to write about, please, let me know. There are times when I’m stacked up with two weeks of posts ready to upload. Now is not one of those times as I’m busy working on a paper or two. And, of course, the incoming news stream seems to be drying up as of late. I’m encouraged by the increasing use of traced photographs in academic publications. This ensures 1:1 accuracy. Color overlays help readers see the extent of bones much better than unordered areas identified by arrows. I’m still hopeful that paleontologists will expand the gamut of their inclusion sets. Maybe we’ll start seeing that in 2014. I’m often plagued by the thought that I’m about to run out of topics. As I near 1000 blog posts, that reality is no doubt coming closer. Inspiration drives this blog, but it’s a fickle emotion, here today, gone tomorrow. The myth of the pterosaur tibiotarsus – the last chapter in the “scathing” series of reviews of Witton’s Pterosaur book. Eosipterus – what is it? It’s been a great year. Thank you for your comments, especially those that improve the data that builds this blog. Earlier here and here we learned about cranial traits that distinguished pre-reptiles from reptiles and the new Lepidosauromorpha from the new Archosauromorpha. Here we’ll look at the post-crania starting with character # 130 from the large reptile tree. 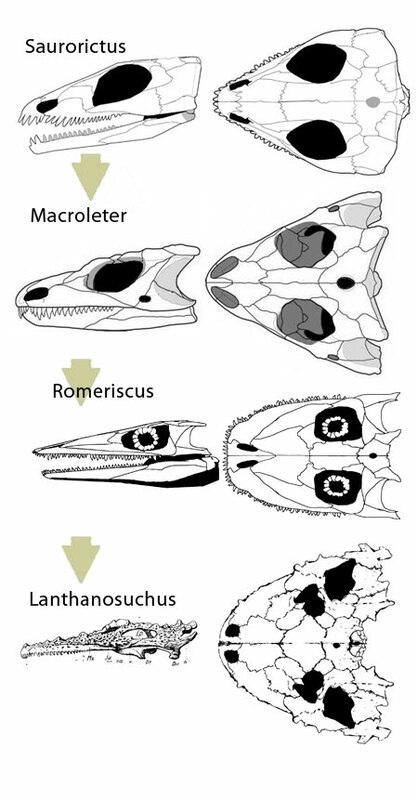 130 – Cervical centra: In pre-reptiles and the new Lepidosauromorpha: height = length. In the new Archosauromorpha: height < length. 135 – Cervical ribs robust: In pre-reptiles and others. In Lepidosauromorphs (but not Cephalerpeton) they are average in size and descending. 143 – Presacrals: fewer than 26 in Gephyrostegus + the Lepidosauromorphs. 26 to 30 in Utegenia to Coelostegus but more than 30 in Brouffia + Westlothiana. 175 – Longest metacarpal: 3 and 4 in pre-reptiles and basal Archosauromorpha. 4 is the longest in Lepidosauromorpha and Synapsida. 187 – Pelvic plates fused plesiomorphically. Separated in Gephyrostegus watsoni, Thuringothyris (basal Lepidosauromorpha?) Brouffia and Casineria. Does this mean these taxa are immature? Maybe. Or maybe this is a transition trait based on size (neotony?). 188 – Pubis orientation – Anterior in pre-reptiles and the new Archosauromorpha. Medial in the new Lepidosauromorpha. Yesterday we looked at pertinent traits 1-39 from the large reptile tree that had a character distribution and division at the base of the reptilia. Today we’ll continue with traits 40-128, finishing up the cranial traits. 45. Frontal with posterior processes – new Archosauromorpha. 52. 69. 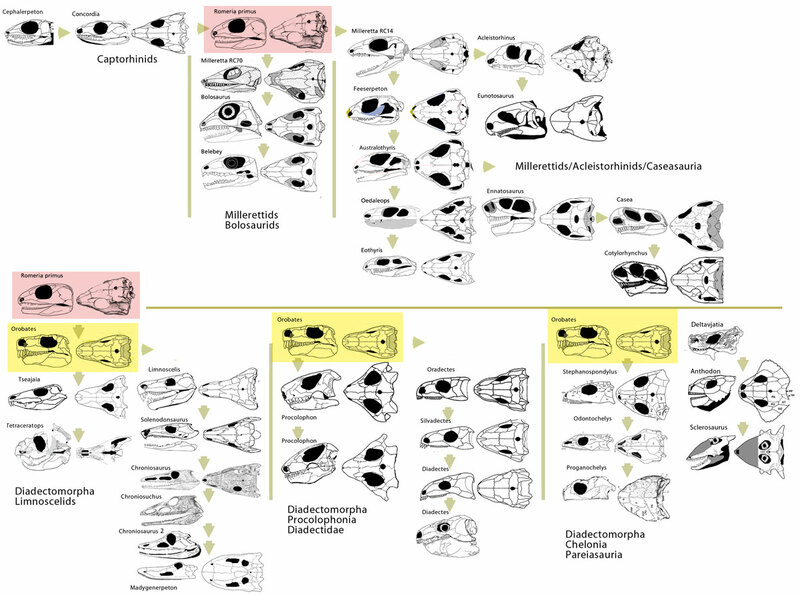 Squamosal descent angle is a big curve, the so-called otic notch, in pre-reptiles. It is obtuse and not indented in reptilia (but reversed following Romeria primus). 56. Postorbital appears as a strip beneath an overlapping postfrontal in Gephyrostegus to new Lepidosauromorpha. The postorbital is otherwise triangular. 57. Frontal/nasal angle is > 45 degrees from the midline in pre-reptiles and the new Lepidosauromorpha. The angle forms a zig-zag in the new Archosauromorpha. 58. Frontal proportions are not less than 4:1 in pre-reptiles and the new Archosauromorpha. The proportions are less than 4:1 in the new Lepidosauromorpha but not Cephalerpeton. 64. The squamosal descends to mid-level, due to a posteriorly deep quadratojugal in pre-reptiles and the new Lepidosauromorpha. The squamosal extends to the ventral rim in the new Archosauromorpha. 73. The quadrate leans anteriorly in pre-reptiles and the new Archosauromorpha, but this short bone is vertical in the new Lepidosauromorpha. 79. The opisthotic rises in pre-reptiles, but is lateral with posterior fenestra in reptiles. 82. The supratemporal is long, not large in reptiles, but this reverses in the new Lepidosauromorpha after Romeria primus. 94. The suborbital fenestra is present in the new Lepidosauromorpha, but not in Cephalerpeton. 96. The vomer teeth are small, not fang-like in the Reptilia. 108. Premaxilla tooth number – Gephyrostegus and Brouffia have 4. Cephalerpeton to the concordians have less than 4. All others have more than 4. 128. Mandible shape ventrally – straight anteriorly then convex posteriorly in pre-reptiles to Brouffia. Straight in Westlothiana and derived taxa. Convex in the new Lepidosauromorpha.